It was during a new year holiday, my family and I went to Kediri to visit one of my grandfather’s relative. I wasn’t sure who she was and what I should call her, but we called her auntie, whose house we visited. It was a long and tiring trip since we went there by car. It took quite long time to reach there. From the city I lived in, it took almost two days by car. Also, we needed to past through a cornfield to reach the house after arriving at the village. Looking from the outside, there was actually nothing wrong with the house. In another word, I could say that it was pretty decent, but I thought differently after I went in. Inside the house, there were things that need to be fixed. There were many flies, too. We went in and had a dinner together. After a while, I needed to go to toilet. So I walked to the kitchen to ask aunty where the toilet is. She then showed me the bathroom. I walked in, and suddenly was dumbfounded. The condition of the bathroom was very different from the usual bathroom I see. It was dark, and the whole room was only covered by cement, no ceramic tile at all. There was a hole in the top corner of the room. It might be possible for someone outside the house to see inside through. There was also a water well inside the bathroom which was practically in the same room with the bathroom but it was only partitioned by a wall, and there was no door. What confused me was, there was no water closet. “Excuse me, auntie, but I need to pee,” I walked out of the bathroom. “Oh, then you can walk this way,” she showed me the toilet which had water closet. It was the worst thing. The toilet wasn’t like the one I usually use nor I normally see; a proper toilet in a room that has a door and water faucet or flush. Instead, to flush it, we had to take water from a well and fill it into a bucket, then bring the bucket inside. The toilet was located at the back of the house and in the same space with goats stall. Once I walked inside, I could hear the “baa” sound, the goats was continuously bleating, even while I was using the toilet. 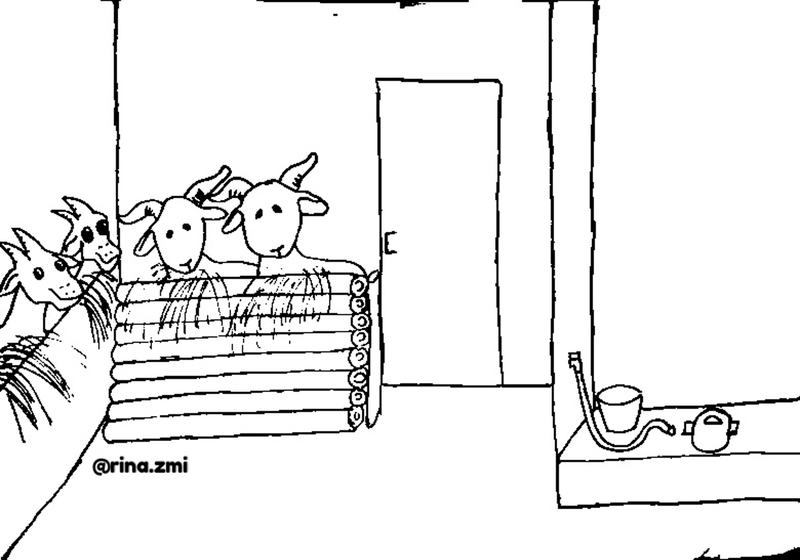 Fortunately, the toilet didn’t really smell bad because of the goats, since there were only four of them. It did smell, but it wasn’t bad enough. The toilet was separated with the bathroom, means they were not in the same room. Both rooms made me taken aback. It was the very first time of me seeing that kind of bathroom, especially the toilet which was in the same space with goats. The bathroom wasn’t any better, either. Since it had no door and was only partitioned by a wall, I felt worried whether someone might came in every time I was inside. My sister and I secretly complained a lot about this to each other because we are originally very care about toilets hygiene and cleanliness, and we were very concerned about the toilet condition here since we had to stay for 4 days. It was hard for us to do our ‘big business’, since we didn’t want to spend longer time in the toilet. Eventually, we held it for two days and we suffered a lot because of that. We felt like our digestion didn’t work well. But we stayed persistent, we didn’t want to take a dump there, because we knew it would be inconvenient. The day after, we couldn’t hold it any longer, yet we stayed unbothered to use the toilet. In the end, we found the solution. There was a new gas station outside the village whose toilets were super clean, even cleaner than the toilet in our house. Fortunately, it wasn’t located too far to reach there by car. Therefore, my sister and I asked father to take us there. We cleaned ourselves conveniently there. It was way much better. Every time I recall that memory, it was funny because we really refused to use the toilet in the house and we minimalized using the toilet as much as we could, and instead felt more satisfied using the gas station bathroom. We knew we couldn’t go to the gas station any time. We, having no choice, still needed to use the doorless bathroom to take a shower. Since it had no door, and we were afraid if someone might walk in while we were showering, so my sister and I decided to took turns. While one of us taking a shower, the other one would keep the ‘door’ to prevent someone to walk in. As usual, we minimalized the duration in the bathroom, so I tried to shower as quick as possible, didn’t care if I showered properly or not. While showering, I saw something moving on the edge of the water tub. I couldn’t see it properly since the room had no lamp. I walked closer to see what it was out of my curiousity. It turned out to be a caterpillar. “Eww!” I screamed. “What happened?” My sister turned her head to see whether there was something. I pointed to the edge of the tub, “look at that.” My sister walked closer, “is it a caterpillar?” Then I nodded. “Eww!” She screamed louder than me. Not only that, we also found a fish inside the water tub, and we wasn’t sure what fish that was. “Ugh, this bathroom is creepy,” my sister complained while quickly finishing her shower. One night, I woke up in the middle of the night when we were all asleep. I looked at my watch and it was 2 A.M. I was awaken because I needed to pee. I didn’t want to go to the toilet since it was dark and no one was awake. I was afraid since it was very silent. I tried to hold it back and went back to sleep, but it didn’t work. I had no choice, I really needed to go. I mustered up courage then walked to the toilet. It was dark so I couldn’t even see the light switch of the toilet. Whatever, I really needed to let ‘this’ out, I could’t hold it any longer. I walked in and just made it quick, then I hurriedly went out of the toilet and went back to sleep. Our visit finally was going to end. We prepared our belongings to prepare to go home. My sister and I had a little chit-chat about all the things that happened here. We learned how to be grateful that we have a decent house and proper bathroom and toilet at home. We also laughed at each other about how stupid we looked when we suffered holding the ‘big business’ for two days. Before we left, the auntie felt bad and sorry for us. “I’m sorry if you all don’t feel convenient here, sorry that our house looks like this and we could have served you better,” she said. Hearing it, I felt sorry for complaining a lot. “No, all of these are more than enough. Thank you for letting us stay here,” my father replied. “Yes, no problem. Please visit again any time,” she said it with a smile. I got to say that she was a nice auntie, but I’d have to think twice if I want to come there again in the future. I’m sorry, auntie, but it was a matter of toilet.